Fujian Hengjiu Energy Saving Technologies has created a solution for anyone afraid of running out of energy when they are riding an e-bike. The Roby solar e-bike will never let you down, as the solar panel automatically charges the battery pack. The Roby is an 18-inch aluminium folding bike with a Li-on 36 volt, 9AH battery pack and a 130 Watt motor, providing a 75 kilometre reach. 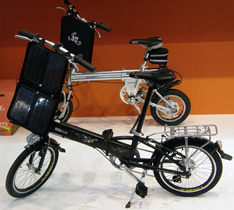 The solar panel, nicely packed in a small suitcase, can be spread out to charge the battery and can also be used while cycling, with the bag with the solar panel mounted on the steering tube. Fujian Hengjiu Energy Saving Technologies specializes in research, production, sales and services of energy saving products. One of their specialist teams is devoted to developing products for daily transportation using the most advanced technologies, such as the Roby solar e-Bike.